Why is it happening? What's to be done? 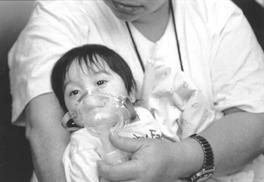 Asthma, a chronic breathing disorder, is rapidly increasing in the United States and many other industrialized countries. Asthma affects more than 17 million Americans, including more than 5.3 million youngsters, and the incidence rate has nearly doubled since 1982. Experts disagree about the causes of the epidemic-like increase, but many now believe the most important factors are indoor air contaminants that trigger the allergic reaction associated with asthma attacks. Medications can relieve asthma symptoms and control the inflammation of the airways that causes asthma, but asthma advocates say some doctors are not aggressive enough in prescribing treatments. Meanwhile, researchers are looking for more effective treatments and trying to determine the origins of the disease in hope of finding a cure.